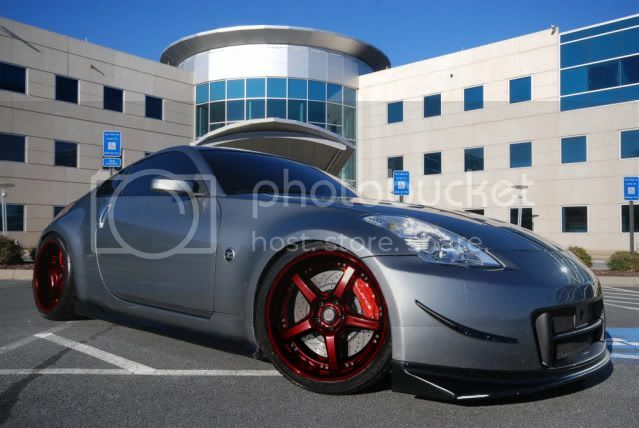 Silverstone Z with red wheels? oh and If you come back with some weak offset wheels, I will ask the moderators to ban your genius ***, lol. So, don't post a picture of some bs wheels, lol. Look what I found. All you have to do know is get them powdercoated red. I forgot that my friend was selling his as well. Marques is correct. powdercoat them and you should be good to go. Those look nice I'm definitely leaning more toward 19's though. Powdercoating runs around $100 a wheel right? dude if you are serious you might of well just get these 20's. I guess you don't realize the wait time for wheels like these. You are talking months on end to get them shipped to you brand new. Just buy them used. You will get them right away and at a cheaper price. Unless you like paying a lot more money just, so you can say I got them brand new and my wheels are 1inch less in diameter. oh ok! Well, have fun! Whats the name of the place in jersey? Came out as a dark anodized red. So brighter red with a polished lip or black lip? That dark anodized red looks awesome. How did the red wheels work out? Quick Reply: Silverstone Z with red wheels?